When we first step out into the space of Adaptive Change, we are never sure what our experience will be. 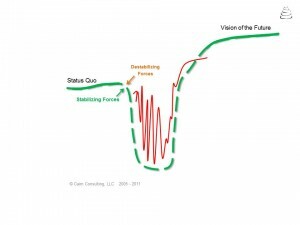 As we encounter Adaptive Strain, the red line of the organization, we experience Personal Strain, our personal red line. Personal Strain arises from the complex interactions between our emotions, feelings, attitudes, desires, and goals. We usually experience Personal Strain through our inner dialogue, the way we explain “reality” to ourselves. Our internal narrative of change is where resistance first arises, triggered by either externally or internally generated psychological and emotional forces. 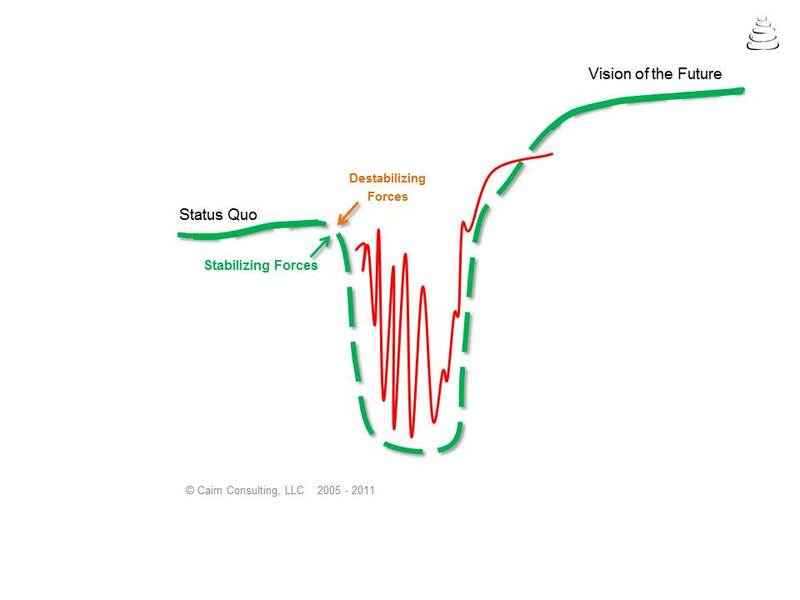 My experience as an organizational change agent suggests that resistance to change is primarily due to the Red Line that change produces. Resistance arises when Destabilizing and Stabilizing Forces clash. Once triggered, resistance, a natural defense mechanism, places the transformational effort first and foremost on the shoulders of leaders and change agents. Paradoxically, when we try to induce change in others, regardless of the process used, they resist. Yet, when we focus on changing ourselves, adapting our behavior to the challenges faced, a community of change agents is formed that collectively drives Adaptive Change. Managing the organizational Red Line requires leaders to take on the tough questions that change produces. How have others successfully changed? This question assumes that there is a “right way” to proceed through change and that someone, other than me, knows how to do this! In fact, no one does – organizational change is a collaborative journey mapped anew each time it is taken. Any worthwhile or necessary change effort has to emerge from the conditions that cause it. This requires significant customization of any “established” or “proven” process to the current Status Quo and may produce different processes in different parts of the organization. Paradoxically, this doesn’t require more work or control or planning, it requires less – opening up space for self-organization to occur. How are we going to do this? This is the question leaders need to ask to generate conversations that support creativity, confidence, and transformational ideas. Collective conversations generate the path forward, one step at a time, while decreasing resistance. This does not mean conversation eliminates anxiety, fear, or loss and grief – they don’t. They do put them in the context of the whole, the collective, the community. I am not going through the mental/emotional challenges of change alone, unnoticed or unsupported. And there is know-how in the collective, actions emerge from the conversations – moving the organization forward one step at a time. 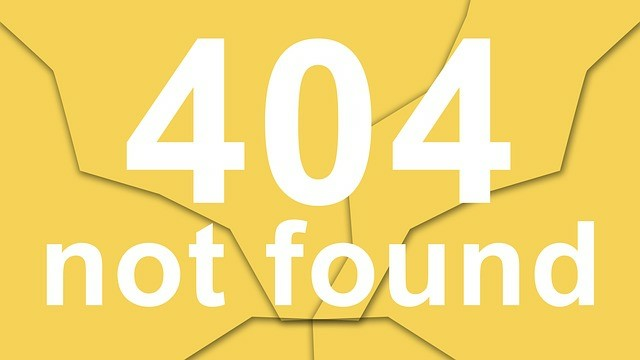 When Destabilizing Events are made obvious, our Strengths are conserved, and a Future Vision is clearly articulated we all know why we have to change. The Red Line is stabilized by our Passion, Purpose, and Principles. Appreciative in nature, What makes us uniquely capable of moving through this change? Engage the individual in the work of the collective – What am I contributing to the change effort? Are highly personal – What am I willing to personally commit to doing differently? Focus on what is working – What have we achieved thus far? Without losing sight of the work still to be done – What choices or challenges are we putting off or ignoring? Adaptive Change is not the time to default to problem- solving, it requires us to identify solutions to the challenges we face. Ultimately, the first Exit Ramp is avoided by Following Yes! A descriptive used by Peter Block and Margaret Wheatley, Following Yes! we find our way to the opportunity that waits when we release the past and embrace the future. We can’t know what the future will bring and we can’t wait for the “right time” to act. We can only act on what is, knowing that our actions constantly produce a new situation with new choices and the ability to act yet again. When leaders take on the responsibility for their personal change and are able to manage their Personal Red Line, others join them in the journey.